I was happily stuffing cheese quesadillas at Boulder’s Monarch High School one morning when a perky young woman in a crisp white shirt, natty black apron and spiffy billed cap extended a paper container filled with freshly mashed potatoes in my direction. In fact, they did need a little salt…But wait! Who was this person, and what was she doing in a school kitchen? Weren’t “lunch ladies” supposed to be old and gnarly and wear hair nets? Turns out her name is Margaret Hancock, a recent graduate of the elite Culinary Institute of America, and she’d spent a good part of the last two years pestering Ann Cooper for a job cooking in the Boulder schools. “I’ve been trying to get my foot in the door since the program began,” Hancock said. Nearby was Hancock’s co-worker, Ali Metzger. She, too, was a CIA graduate. “I was joking that if people at the CIA knew Ann Cooper was advertising jobs on Craig’s List, they’d be all over it,” Metzger quipped. News flash, Ali: They already are all over it. There are two CIA externs waiting to move to Boulder as we speak. 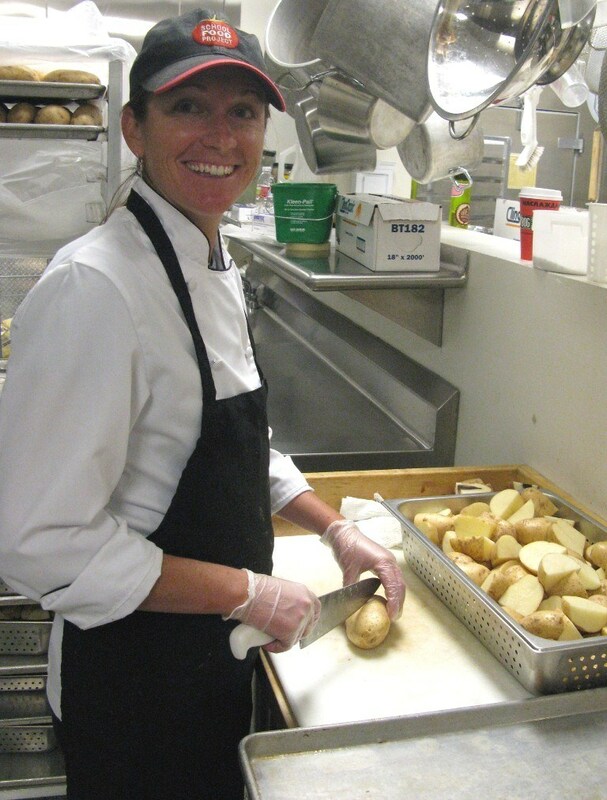 As I discovered during my week in Boulder school kitchens, Cooper not only is remaking the food service in area schools, ditching junk food for meals cooked fresh, she’s also created a parallel culinary universe where newly trained chefs forgo a glamorous career in fancy restaurants in order to mash potatoes for teenagers. Even the sous chef who runs the kitchen at Monarch High has caught the fever. Yuri Sanow, a professional chef of many years experience, was working at the Black Hawk Casino when he saw an ad Cooper posted on Craig’s List. He gave up a hefty annual bonus to pull up stakes and come work in Boulder. Before you imagine a trend sweeping the school food landscape, know this: These people have no interest in slinging corn dogs and tater tots. They’re only here because Cooper, in her makeover of Boulder’s school menu, determined that what the schools needed desperately was a handful of production kitchens manned by trained chefs to make meals for the entire district. The chef’s jackets, aprons and monogrammed caps reading “School Food Project” are all intended to project a sense of order, competency and professionalism. In Boulder, lunch ladies never had a uniform before. Sarah, who asked not to be identified by her last name, was a sous chef at an upscale Boulder restaurant who wound up in a school kitchen as a parent volunteer. But she was soon ready to quit after she saw the stuff the schools were serving as food. “They said, ‘Hang in there. Ann Cooper’s coming.’ And they gave me a copy of her book.” Sarah now directs the meal service at Casey Middle School. Prior to Cooper’s arrival, food was being prepared by those very same lunch ladies in 22 of Boulder’s 48 schools. Eleven kitchens made food for multiple schools. Eleven prepared meals only for individual schools. The cooks involved were minimally skilled. They received virtually no training or oversight. Cooper cringes to think of all the waste and inefficiency involved. In her ideal world, she would consolidate all of the district’s cooking into one central facility where everything could be managed to a fare-thee-well. A central kitchen that size, she said, would probably cost $10 million and require voters to approve a bond measure. And that is precisely her objective. Now in her second year of the makeover, Cooper has reduced the number of production kitchens to five and hired a busload of eager chefs–some young and starry-eyed, like Hancock and Metzger, others older and more experienced, like Sanow–to prepare the food. Henceforth, the lunch ladies would only re-heat and serve it. The great kitchen re-alignment started with a simple formula: 20 meals for every hour worked. That’s the production level Cooper would aim for and it spelled bad news for the lunch ladies. In order to accommodate the new production teams–five district managers, each managing eight or nine schools, five sous chefs, and assistants such as Metzger and Hancock for each sous chef–hours would have to be cut elsewhere. The entire kitchen staff, meaning all those lunch ladies, works part-time. And, yes, some work as few as two hours per day for wages that start at $10.61 an hour. If they make it to “step 7,” they could look forward to $14.81 an hour. That compares to a pay range of $13.64 to $18.59 an hour for production cooks. Sous chefs who run the production kitchens earn “around $40,000” Cooper said. According to one published report, some of the kitchen staff now complain that they have to work hours off the clock to complete their assignments. 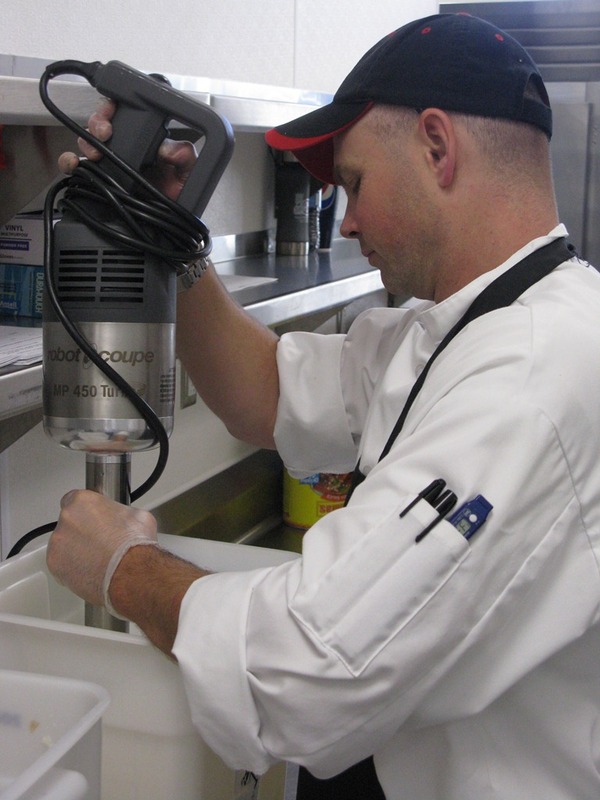 To get everyone on the same page, Cooper in the first year of the program–fall 2009–spent some $200,000 in privately donated funds for a week’s worth of training for the entire kitchen staff. That meant more than 150 employees took the ServSafe course in food sanitation. Two long-time collaborators of Cooper flew in from California to teach basic kitchen skills: how to re-heat and serve food, how to use a thermometer, how to use knives, how to set up and break down salad bars, how to manage a cash register. There were team-building exercises with a local coach. Cooper and her business partner, Beth Collins, also gave instruction. This year, in August, Cooper spent another $75,000 training her new production crew, giving basic lessons in how the Boulder system works, familiarizing them with recipes, how to pack and ship food. A software representative came in to explain a new system for integrating recipes, production schedules and inventory. One of the five new district managers is Brandy Dreibelbis, who gave up a job as executive chef for Whole Foods in Boulder to lock arms with Cooper. Originally from Delaware with a degree in hotel and restaurant management, Dreibelbis had spent years working a frantic pace in restaurants when she took a flyer and applied for a job with Whole Foods. 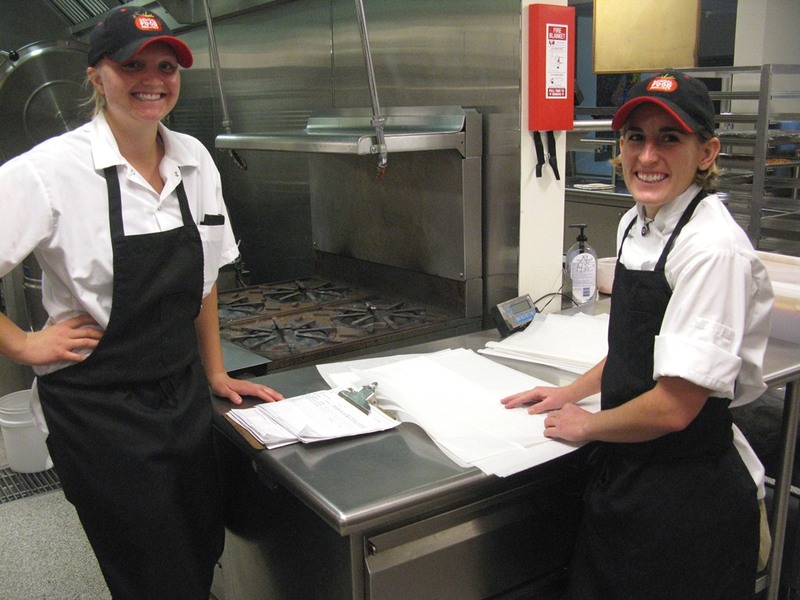 She landed in Boulder, and within six months had the top kitchen position. She liked the new lifestyle, too: formerly a beach girl, she climbs mountains, skis, hikes in winter on snow shoes. 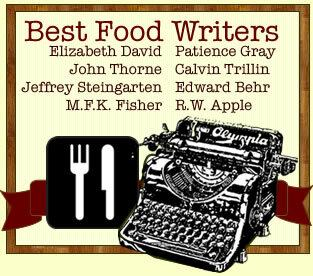 But after two years as executive chef, she found few options to advance and continue cooking. Meanwhile, she’d seen numerous reports about changes happening in Boulder’s cafeterias. Whole Foods was raising money for the project. Not only did Dreibelbis take the job, she started poaching talent from among her former underlings at Whole Foods. That would include Ali Metzger and Margaret Hancock’s twin sister, Michelle, who works as a production cook at Casey Middle School. She took a pay cut to leave Whole Foods. 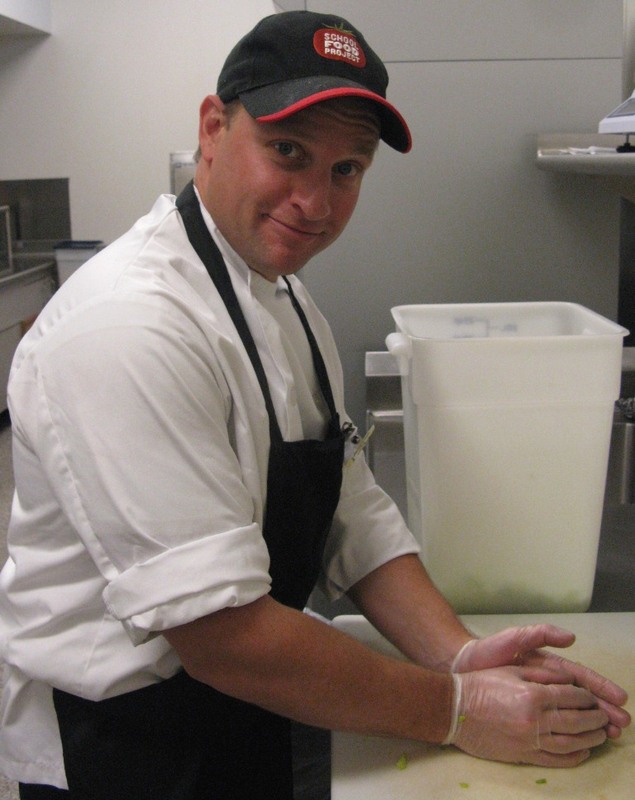 Hancock’s supervisor, Sous Chef Phil Stinar, a onetime Army cook, was recruited by an old colleague in the restaurant business who also had signed on with Cooper as a district manager. With 25 years of corporate kitchen work under his belt, Stinar has been around: regional manager for Applebee’s, eight years at Cheescake Factory, a stint at Rock Bottom Brewery. He likes the mellower pace of a school chef. 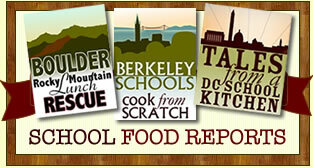 Next: The new food in Boulder schools. It’s not quite cooked from scratch…yet. Kudos to all these ladies! I SO would love Chef Ann coming to our school district too and I would SO join her team too! Hands on Crusaders for the well fare of the kids! Very noble and inspiring this is! Keep it up. 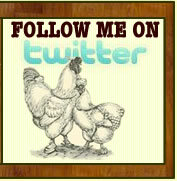 I am supporting the work of Chef Ann Cooper where I can! This is so smart. This is what our school lunch programs need – energetic people like this who care. It’s nice that Jamie Oliver is shedding light on the problem of nutrition in school food – but it’s just too big a job for one guy no matter how famous he is. Kudos to all of you!! Excuse me- what is YOUR tone here? How about a little respect?